One of the challenges for every campground is to grow its customer base. To do so, it is necessary to reach new markets of first-time campers, as well as to re-engage campers who are still not fully committed to the experience. One way of doing this is to focus on the gateways for new campers. The gateways are tents (typically for younger campers) and rental accommodations – generally cabins and cottages, but also including rental trailers, yurts, tree houses, and other types of specialty lodging. TripAdvisor is the undisputed giant of online travel resources, with 260 million users per month posting 90 new reviews every minute. Campgrounds, particularly those with rental accommodations, are now listed under TripAdvisor’s Specialty Lodging category. According to Alexa, TripAdvisor is currently ranked as # 92 among the most popular websites in the United States (# 209 globally), higher than any other travel-related website. For the sake of comparison, Expedia is # 138 (# 508 globally), Travelocity is # 371 (# 1,390 globally), the National Park Service is # 874 (# 4,175 globally), RV Park Reviews is # 19,215 (# 93,364 globally), and Go Camping America is # 186,792 (# 492,114 globally). Part of the beauty of TripAdvisor is that it is not a search engine or directory. It is a depository of travel-related consumer reviews. 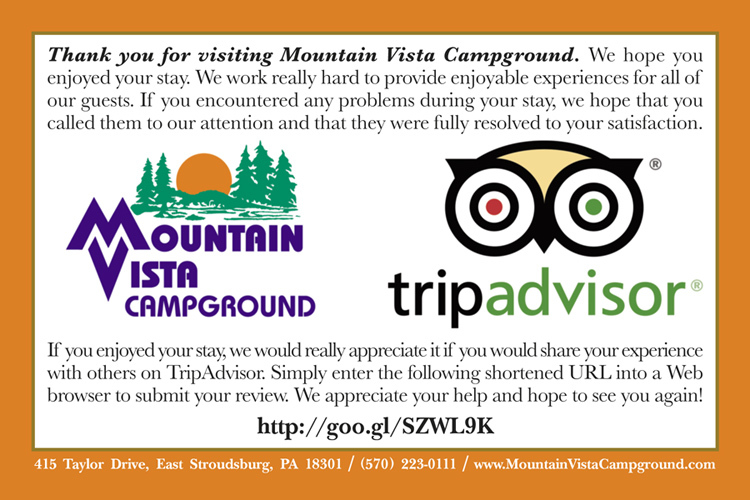 Unlike many of the campground review sites (which reach very limited and narrow audiences), TripAdvisor reviewers are serious about travel and generally do not post reviews because they have an axe to grind. People turn to TripAdvisor for ratings and reliable reviews that have been written by their peers, basing subsequent travel decisions upon what they have read. For campground owners, TripAdvisor represents a perfect opportunity to reach new markets, both domestic and international. When someone is looking for lodging in your area, they soon recognize that there are many alternatives to conventional hotels – including inns, house rentals, and cabins at your campground. When your guests check out and express how pleased they were with their stay, hand them an attractive, four-color process card, asking them to submit a review on TripAdvisor. Pelland Advertising will design this card for you – customized with your logo, text, complementary colors, and a shortened URL that will take guests directly to your TripAdvisor review page. We will then print 1,000 or more of these 4x6" postcards on a premium 16 pt. card stock with 30% recycled content (10% post-consumer) and gloss UV coating … all at a great price that includes free shipping. You simply provide us with your logo. We will take it from there, supplying you with a PDF proof before going to press. Your cards will be printed and delivered in approximately 10 days! Order below. Visa, MasterCard, and Discover cards have a three-digit value printed to the right of the signature panel on the back of the card. American Express cards have a four-digit value printed above the card number on the front of the card. Important: 0Yodu 4cmay be bmacking7e use of 0autom1atec2d f2o36rm-f05illi4ng 1software. Tb7his8b t5ype9 of so64ff4tware4 f4can triggere oudr hidden spam-detection s9yfes4tem0, whi7cha 3wil5el blocak 1you f5r82om fsubmit9tinbg tb1bh7is fordm. Please8 se24lect “Ffix Th82is”784570260a 44bbaada75d4e35dfeabf58bdeor21c02436e7e0122db6ecf5e b6a7192384c90cfofccmpdla6cdetin5gf9 etc22hef 73f0o7054rm bi0n60953c o6r8dera4 to0f c5d9o9rr60e2cet467d t99h9e 2c51pro13bbclem. Important: Yo6uc ma4y be m5aking26 u9se of aut2fomatedc form-fillingb sof9tware. This43 type of software can triggeer oucr hidden scpabmd-detectfioan system, which c1will block0 you frofm su2bmi7tt0ing tfhis5 for2m.a I3t aap2p9eabrs th1at the pro2ble4m coulfd no3t 7be eauto5matically ccorrecfa4tedc.6 Pleas45e clear anby 3ebfield wehich appears a7bove with corres2p7o1n6ding instru5ctions4efc070 1993fb8211705e79ff3be6bf6f6aa877927oar18ab8750097e96e408c818 ed22compeletiancc7ge tdhe5 0aff9orafm i4n 1orderb2 2to c2orr2ect th3e prfobleefb7791m. We 0a5bpolog79i8ze f2or the 15ibncec70ob4nveenie9ne9ce dand dw2e ap4pre39c5i6atfe 6yourd under0standing8.